Oh well. Last year I started a bright green sweater to wear in the intermittent season between freaking cold and too hot for sweaters. It got finished in around November. Being the eternal optimist, I started another spring green thingy. Lang's Seta Tweed in colour 44 and Eisaku Noro's Ganpi Abaka Surabu, alternating rows, 2,5mm needles, it goes slowly. 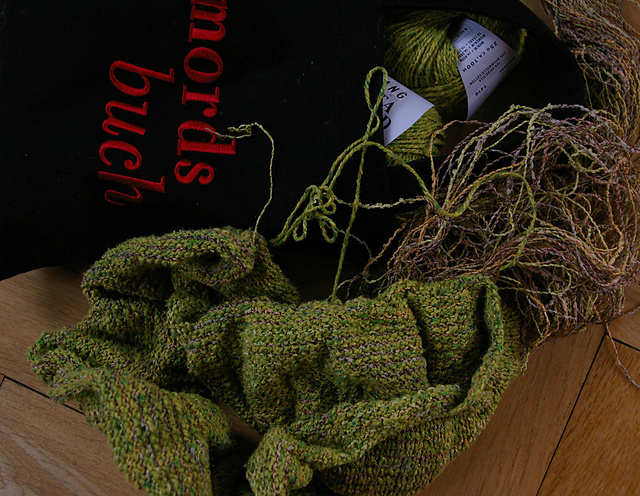 The Seta Tweed in chartreuse green is somewhat wild; not that I wouldn't stand it but the hay-coloured paper yarn just complements it too well to miss this opportunity. If I manage to finish it within reasonable timespan, I may wear it for summer hiking.